People love babies. Just watch a group of women talking around one baby. Everyone chatters away until the baby utters a single monosyllabic sound while waving his arm. Suddenly, all chatter stops and everyone’s eyes turn to the baby. Curious gazes watch to see what the baby will do next. Then, as the baby makes eye contact with the women, a collective “Awwww” will be released. Guys, we love babies too. Admit it. Research has already outed us by revealing many men get “baby fever” and go all “goo-goo” in response to babies (Read “Baby Fever is a Real Emotion”). 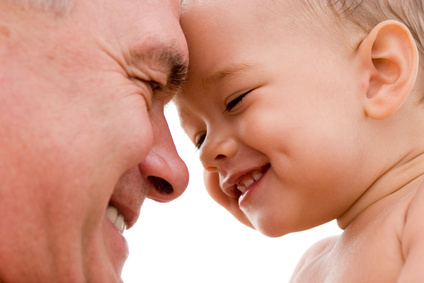 Men and women delight in babies. They arouse our curiosity. We want to know what they are thinking and feeling, so we pay special attention to their every move. We follow their gaze to see what attracts their attention. We engage them in a variety of playful ways to see what draws them to us and makes them smile. We present various toys to see which ones they like the best, to discover what interests them the most. We make faces and look silly in an effort to make them laugh and repeat that silly behavior until they tire of laughing. Every day our curiosity leads us to learn something new about our baby. We listen closely to every sound, learning to discern which cry sounds the alarm for a diaper change and which cry signals hunger. We observe their face with curiosity, learning which face calls for comfort and which means they have gas. We love babies. They arouse our curiosity and we become their students to learn as much about them as we can. Unfortunately, those acts of curious delight change as our baby grows through toddlerhood, childhood, and into adolescence. Rather than following their gaze to discover what attracts them, we begin to tell them to “quit staring.” We direct their gaze in directions we believe will limit their risk and decrease our fears. Instead of exploring what attracts their interest and holds their attention, we tell them to pay attention to whatever we deem important (our directions, church, school, crossing the street). We don’t explore what it is that does attract their attention and so lose the knowledge and opportunity needed to present them with alternative attractions that we deem safe and interesting to them. When their play becomes silly we judge their maturity or lack thereof. Rather than playing to discover what draws them to us, we judge their pulling away from us as a lack of appreciation for all our efforts. Instead of creating opportunities for them to laugh at and with us, we tell them to grow up and get serious. We listen half-heartedly while labeling or minimizing their emotions rather than discerning the need that lies beneath the emotion. We scold and assume negative intentions instead of trying to figure out what is causing their outburst. I understand it. We want our children to learn. We want them to mature. We want to keep them safe. So, as they grow, we replace our curiosity with discipline. As a result, our relationship, and our influence, suffers. In reality, we do a better job of keeping our children safe, helping them mature, and teaching them important life lessons when we maintain our curiosity. Sure, we have to discipline; but when discipline replaces curiosity our children suffer. When we maintain playful curiosity, our children will more likely reveal their emotions, intents, fears, and desires to us. As we maintain a curious observation of what bothers them and excites them, we will also learn what comforts them and motivates them. When we find ways to continue laughing with our children, they will feel free to cry with us as well, providing us the opportunity to comfort them. Maintaining a playful curiosity in our children (even when we need to discipline) will enhance our relationship with them. It will increase our opportunity to influence and guide them. It will allow us to watch with great curiosity how they mature into confident adults. So have some fun. Be curious about your child and your teen. Be silly. Play. The world will be a better place for it! I don’t mean “smell” as an adjective. Maybe I should finish the title…“Happy Families Stop to Smell the Roses.” Yeah, that would be better but…too late. Anyway, if you want to come home to a happy family, teach your spouse and kids to slow down. Teach them to appreciate the world around them. Show them how to pay attention to the moment, to stop and smell…the roses. If we do not practice appreciating the world around us, and teach our family to do the same, we will likely get caught up in the busy-ness of life and miss the joy of sharing the moment together. We will find ourselves worried about the next activity or fretting about what we did last week and, in the process, miss the opportunity to enjoy time together right now. We will miss the joy of slowing down and smelling the roses. When you and your family learn to enjoy the moment, on the other hand, you will experience greater happiness and enjoy many eternal moments of joy. Here are three tips to help your family appreciate the world around them. Be intentional. Put aside worries about what’s coming up and forget the past for the moment and intentionally focus on the “here and now.” Rather than talk about what happened today in the news (although an interesting topic for another time) or your plans for vacation next month (another interesting topic for another time), talk about your experience of the here and now. Use all your senses. Talk to each other and share the sights, sounds, smells, tastes, and sensations of your current experience. For instance, walking through the monkey house at the zoo offers a plethora of sights, sounds, smells, and physical sensations that easily become part of the conversation. Eating your dinner also presents colors, tastes, aromas, and oral sensations (crunchy, chewy, slimy, soft, etc.) to share with one another. You can still talk about the past and future, but save it for another time. Intentionally take 15 minutes each day to focus on your experience of the here and now. Accept one another’s experience as well as your own. Realize that not everyone will experience the zoo the same way you do. We all have slightly different experiences of the world around us. Rather than judge your experience or your family’s experience, accept each person’s experience as unique and learn from it. You might try to discover the experience they describe. Or, you might simply enjoy your differences and appreciate the opportunity to learn more about the other person. I have a friend who describes the smell of skunk as being like french fries. As hard as I try, I cannot find that same experience; but, in accepting his experience I have come to appreciate his awareness and wisdom of the outdoors. Whether you experience an event in the same way as your spouse and kids or not, do not judge the experience. 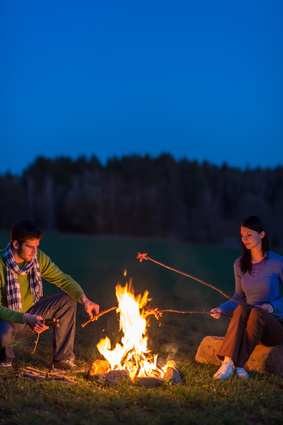 Simple accept and enjoy…together. Choose one or two activities you might experience and appreciate as a family each day. You might choose appreciating the sensations of a walk in the woods, eating a meal, enjoying an outing, listening to music, or any number of other activities. Use your imagination and create moments of slowing down to appreciate the world around you. Appreciating the world around you will also increase your sense of awe. As you experience the moment with your family you will discover amazing things—sights, sounds, tastes, and smells. You will stand in awe of the complexities and intricacies of world. And, promoting this sense of awe in your family carries its own benefits, such as greater patience! (Read more about the benefit of awe in Using the Power of Awe in Your Family.) So, slow down and smell the roses to increase the happiness in your family! By the way, you can learn more about appreciating the world to increase happiness at Actions for Happiness. Have you seen the advertisement for the “Delmio Pepper Hacker”? I want to purchase one. Watch the 2-minute video advertisement and see if you might like one for your family as well. You know, you can reclaim dinner time without the Delmio Pepper Hacker. You can establish dinner time as a tech-free time—no technology at the table or in the dining room. Make dinner time a family time, a time to focus on family conversation and interaction. The art of parenting has gotten lost amidst media hype and controversy. Instead of focusing on effective common sense aspects of parenting, the popular media turns our attention to the sensational and controversial. 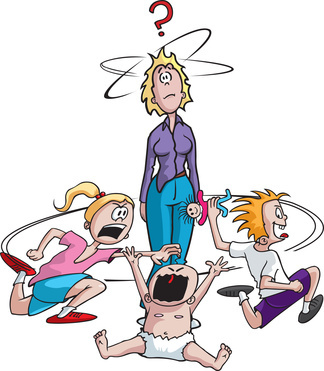 Tiger moms, free range parents, helicopter parents, attachment parents…a dizzying array of parenting styles presenting the opportunity to debate and argue, which may be great for media ratings but not so good for effective parenting. What is a parent to do? In reality, each of these parenting styles actually has benefits; and each can have a negative impact when taken to an extreme. Take a moment with me to consider the pros and cons of each of these parenting styles. Tiger Mom Parenting. Tiger moms balance high expectations with love for their children; and children tend to live up to the expectations of those who exhibit great love for them. Tiger moms teach that persistence and effort leads to success. This helps children develop a “growth oriented mindset” shown to result in persistence, effort, and resilience. On the other hand, tiger moms can become intrusive. 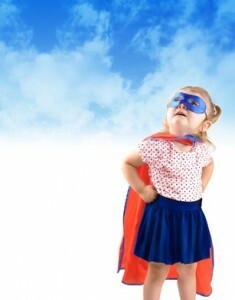 Their children may experience difficulty establishing an identity apart from their overinvolved and demanding parent. Children may even rebel in an effort to establish their identity apart from parental expectations and demands. Helicopter parenting. Helicopter parents obviously love their children. They delight in their children and want them to grow into successful adults. To aid in this growth, helicopter parents maintain an awareness of their children and their children’s world, create opportunities for their children, and leverage the environment for their children’s success. This can lead to some wonderful opportunities and successes for their children. Helicopter parents can also become intrusive. If they do not allow their children to experience failure, they rob them of the opportunity to learn persistence and resilience. By fighting their children’s battles, they rob them of the opportunity to “fight for themselves” and problem solve under pressure. In the long run, children whose parents manage their environment and time too closely will prevent their children from learning to manage their own schedule and assure their own safety. Attachment parenting. Parents who practice attachment parenting delight in their children. They become active students of their children and their children’s world. Children of attachment parents come to see themselves as valuable, significant, and loved. They learn to talk through and resolve concerns and disagreements they might have with other people. Taken too an extreme, attachment parenting can result in permissive parenting. Children may not have clearly defined limits reinforced by a consistent “no,” whether spoken or unspoken. Although they learn to solve problems with like-minded parents, they may experience difficulty working through the drama introduced by other children who have not learned these skills. Free range parenting. Children who experience free range parenting learn independence. They learn creative problem solving as they experience various obstacles in their life. In addition, children of free range parents learn how to manage their safety. They learn what they can and cannot without adult help. Free range parenting also allows children to learn how to manage their own time and schedule effectively. Free range parenting, when misapplied, can result in neglect. If parents are not aware of their children’s developmental needs and unique vulnerabilities, they can place their children at risk of harm or overwhelming failure. Overall, we find parenting strengths in each style of parenting. We also see that any parenting style can be taken out of context and misapplied in response to our particular fears or weaknesses as a parent. Rather than getting caught up in the debate and controversy of the latest parenting fad, take the time to learn what makes each parenting style effective (whether you want to call it a balance of love and limits, rules and relationship, or structure and love). Then—whether tiger mom, helicopter parent, attachment parent, or free range parent—practice that balance with as much consistency as you can muster. My family loves to laugh. Just last Friday we were walking back to the car after eating dinner at a local fish fry when my daughter said something that struck her older sister’s funny bone. She started laughing. She laughed so hard we had to stop walking to allow her to wipe tears of laughter from her face. Several weeks ago we were enjoying a little jovial banter around the dinner table when something struck my wife as funny. She started to laugh. My oldest daughter caught the “bug” and joined the “laughter contagion.” My youngest daughter and I looked at each other before sitting back with a chuckle to watch them roll around and cry in laughter. (PS—this happens a lot at our house…my youngest daughter and I actually instigate it when we can). And, we love it. I love to see my family laugh. I love to laugh with them. Laughing together creates wonderful memories filled with unconditional acceptance. 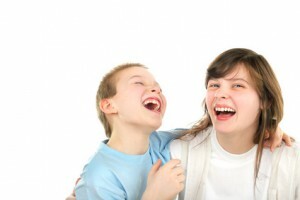 Laughter within a family indicates a feeling of acceptance, a sense that one is safe enough to “let go” and laugh. Laughing together bonds us together, increasing “group cohesion.” Who doesn’t want to belong to a family filled with memories of warm acceptance experienced in laughter? Laughing together replaces fear and shame with togetherness, hope and well-being. It reframes fear into moments of acceptance and events that we can manage and resolve, even laugh at. It releases shame and replaces it with the knowledge that we are accepted in spite of our shortcomings, mishaps, and failures. Laughter also increases hope, self-esteem, and well-being. Laughing together builds a sense of safety for everyone present. If we can laugh together, we can approach one another with humor and resolve differences together as well. After all, laughter enhances problem-solving ability, creativity, and perspective. We can all feel safer knowing we approach differences with the creativity and perspective provided by a good sense of humor and laughter. Laughing together is contagious. One person with a genuine laugh will bring at least a smile to the face of each person present. As that smile turns to laughter, our lives become entwined in the joy of the moment. We become more intimate as moments of laughter release the frustrations, tensions, and even anger that separate us. I love to go to the movies and the theater. But, it can be expensive to take the whole family to the movies today. Maybe you have had the same thought and would like to have a family theatrical experience without the box office expense once in a while. Like me, you may be looking for a way to have fun at family gatherings, allow your kids to use their creativity and technological skill while involving the whole family in one activity…and avoid the box office expense. If so, here is a great idea: put on a play! You may think this sounds a little crazy, but it can really be a lot of fun. Everyone in the family can participate in the play or a few can perform while everyone else participates as the audience. In our family the children often put on the play and the adults participate as audience members. You may choose to do it this way, too. If you do, encourage your children, applaud, laugh, and acknowledge their hard work. But remember, adults can put on a play as well. I remember participating in several intergenerational plays when I was a kid, particularly funny ones. Your play can be serious (we saw children put on a play focusing on the resurrection just before our Easter dinner) or humorous (like this men’s skit). You can make it a musical or keep it a straight up play. Part of the joy of putting on a play is the preparation.You get to pick a theme everyone can enjoy, write the lines, and practice (well, at least a little) before the actual performance. Each step involves time spent together, laughter, discussion, sharing of ideas, cooperation, and fun. Then, during the performance everyone offers encouragement and applause, laughter and “call outs.” Of course it’s a good idea to recruit one of the children to record the performance so you can post it on YouTube or FaceBook (just to share the fun with others). So, why spend the money to take your family to the theatre for a fun night (although this can be fun, too) when you can stage the next box office hit right in your own living room, written by your own creative geniuses and performed by the upcoming stars in your family? Have fun! A study recently published in the National Academy of Sciences reveals how to raise a narcissist, a person who believes they are better than everyone else. This study suggests several things that can contribute to the raising of a narcissist; however, one contributor is completely in our control. Every parent needs to know about this one contributor so they can avoid it. Specifically, this study suggests that parents help “turn their children into little narcissists by overvaluing them.” Really? Yes, children believe it when parents tell them they are more special than others and entitled to special privileges. Over time, they internalize that belief. They begin to treat others as less special than themselves. They act as though they deserve special privileges and entitlements. They become little narcissists. Parents might overvalue their children in subtle ways or very obvious ways. Consider just these three ways that parents can overvalue their children and communicate that they have special value or deserve special privileges. Parents overvalue their children when they claim their children have special knowledge of many different topics, even one’s that don’t exist. In a study by the same authors, parents were asked if their children knew about “Queen Alberta” or “The Tale of the Benson Bunny.” Some parents claimed their children knew all about them. Ironically, the researchers made the topics up. When we claim our children know more than they actually know, we overvalue them. We risk creating a narcissist. Parents contribute to the creation of a narcissist when they protect their children from consequences. When children are accused of wrongdoing and our immediate, adamant response is to defend their integrity, we may do them an injustice. Perhaps we need to do a little investigation first. We need to assure our children are innocent before we defend. Consider their track record. Get more information. Gather the evidence. Then determine a course of action. If we defend our children in spite of a poor track record and in the face of evidence to the contrary, we are teaching our children to overvalue themselves. We are helping to create a narcissist. Parents help raise a narcissist by treating their children as though the world revolves around them. You know what I mean: letting them get out of helping around the house because they are special; encouraging their coach to give them special treatment because they are so much better than the other players; pushing teachers to let a grade slide because our little angel tried so hard or had other obligation; demanding others treat your child special because of their position or the position of your family; or, giving your child special treatment because they are so sensitive. These actions only help create a child who believes they are more special than others, a narcissist, entitled to special privileges. Instead of treating your child as extra special, express realistic affection and warmth. Allow them to fail and grieve that failure, get back up, and try again. Let them experience the consequences of misbehavior. Appreciate the talents they have but teach them to appreciate talent in others as well. Encourage them to humbly accept what the coach tells them, even if they do have a better record than the guy who starts before them. In fact, teach them to encourage that other player rather than begrudge them. Teach them to listen to and respect their teachers and other adults in their life, even if they disagree with them or dislike them. The choice is yours. You can treat your child as extra special, deserving of special privileges and entitlements and raise a little narcissist. Or, you can show your child affection, let them experience consequences, and teach them to be considerate of others. Then you can watch your child grow into a humble caring young adult. My mind has not cooperated with me lately. I want to write a blog on family, parenting, or marriage and my mind just doesn’t want to cooperate. It wants to wander, go blank, or think on other things. It wants to do anything but help me write blog related to family issues. Right now it is Saturday before Easter and my mind wants to dwell on that. Please bear with me as I share. I wonder what the disciples thought on that Saturday after Jesus’ crucifixion. Jesus is in the grave…dead. The Word has been silenced and there is nothing left to say. The Way has gotten lost and we are left to wander aimlessly. The Truth is believed a lie…. Where can we place our trust and faith? Life Himself is dead! The Light of the World has been blown out and darkness surrounds us, leaving us to sit frightened in the midst of the unknown and unseen. The Good Shepherd is gone and we (His sheep) are vulnerable—without food, guidance, protection, or care. The Living Water has dried up. We are left high and dry, parched and dying of thirst. All Hope is gone. Our only Hope has been buried. Jesus is dead. But wait…in the silence something stirs. Prophecy whispers hope as the buried seed shifts in its grave. The heart of creation begins to tremble ever so slightly with anticipation. Tomorrow waits impatiently to dawn. Sunday is coming! Light will break forth like the dawn. Truth will be confirmed and authenticated. Hope will take root and shoot into the sky. The Way will once again guide us into Life. The Word will share His Wisdom and redemption. Yes, Life will burst forth from the tomb and lead a triumphant procession of those once held captive. But, today I ponder a quiet day of anticipation. Tomorrow will come! 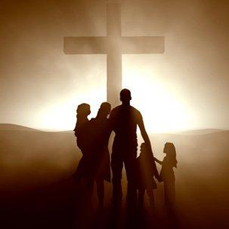 How will your family celebrate the Resurrection Day?